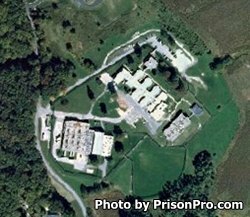 Central Maryland Correctional Facility is located in Sykesville Maryland. It is a minimum security institution that houses over 495 adult male inmates. On average, offenders stay at this prison about 18 months. This facility employs 119 people and has an annual operating cost of $14.4 million. Offenders incarcerated here can earn a GED and receive substance abuse treatment. Inmates at Central Maryland Correctional Facility can participate in many programs while incarcerated. One of the programs allows the inmates to work with retired horses, another program provides industrial cleaning supplies for many institutions. A massive laundry operation known as the Central Laundry employs 120 offenders who work processing the laundry for many facilities. Visiting is on Tuesdays, Thursdays and Fridays from 7pm-9pm (must be registered by 8:30pm). You can also visit an inmate on Saturdays, Sundays and State recognized Holidays from 12:30pm-2:30pm and 7pm-9pm (must be registered by 2pm for the first session and 8:30pm for the second session). Visits can be up to two hours in duration and inmates are allowed two visits each week, but only one of the visits can occur on the weekend. An inmate can have up to four visitors at a time including children.